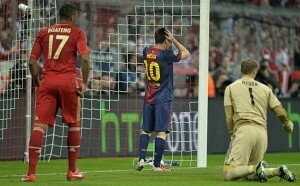 suffered in the hands of Bayern Munich as "a disgrace". to salvage anything from the tie. "It's 4-0 and it will be difficult because they are a great team,"
a disgrace what happened, but we have to go on. must win la Liga soon." the Champions League, but waved aside talk that his fitness was key. but I was not injured, so I could play," the 25-year-old insisted. Messi is very ambitious sha!!! Wot u think bout this guyz! !